Great fast service. Reasonable pricing. Friendly employees. They fixed my problem the day of. Would recommend to anyone. 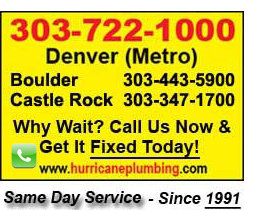 Casey G.
These guys are great and very helpful from the minute they answer the phone to the end of the service call. Hey I am a happy happy customer so call them! Carol S.
Thank you for the efficient and professional service that you provided today. Juan was courteous and knowledgeable and did an outstanding job. We will use Hurricane Drain for all of our plumbing needs. Charles & Janice C.
Just had these guys out for the first time. They were great. The lady in the office was very nice and the service person was very professional and extremely competent. The price for the shower valve installed seemed very reasonable. Great Company! Highly recommend! Bob F.
Top Quality Vlad came out last week and was great. Thank you for being such an honest company with great customer service as well. This is why I continue service with your company. Michael G.
We had Omar out and I just want to say he did an amazing job. He was so helpful in explaining the problem and how we would benefit in long run. We will be calling back for more work and asking for Omar. Steve M.